When I got back from Vegas I put Al in charge of the IOMEGA 8 bit Host Adapter project. I also still had projects for AST, ALR and Data Systems and I had Bawn working on those. In addition to disk host adapters we were doing RAM, Serial, Parallel and other port add-on’s for the IBM PC and compatibles at that time. The host adapter IOMEGA introduced at COMDEX 1983 for the IBM PC had serious compatibility and reliability issues. IOMEGA wanted a new reliable low cost 8 bit host adapter, followed later by a high performance 16 bit host adapter for the new IBM AT, and a serial IO interface module for the new Apple Mac which was being introduced in 1984. The first priority was the IBM PC 8 bit interface card as that was the only product IOMEGA was shipping at the time. I put Al Pease on the project. Al’s design of the eight bit card went smoothly; we all collaborated on the basic architecture of the design with Al. It turned out great and IOMEGA was happy with the hardware and software. I decided to put Bawn on the new IOMEGA 16 bit adapter project. Bawn came up with a design based on the IBM AT DMA channel design. I was concerned with that design; I felt that a non-DMA 16 bit card was a better choice, since that is the choice IBM had made for their AT disk controller. I was concerned that the AT DMA controller had some unknown problems since only one add-on card from IBM used it, and that the software would be much more difficult to write. Bawn felt that the DMA controller would provide superior performance. In the end it was his project and I felt he could deliver. Bawn was also responsible for the Apple Mac interface, which was due shortly after the IBM AT interface. After he finished the IOMEGA 8 bit adapter Al started on the GBT terminal project. His initial design was quite complicated and it was not clear to me we could deliver the feature set GBT wanted. I had some experience with terminals since we used one for the console on the Burroughs B5900 mainframe I designed. In that design we used an Intel 8086 microprocessor and a memory mapped screen IO scheme. This allowed for an almost unlimited feature set on the screen as opposed to a hardware screen decoder which was common in terminals at the time. For example, by using the memory mapped microprocessor technique we were able to offer a magnifier function, where a portion of the screen could be magnified 2x or 3x normal for visually impaired. I suggested to Al that we use that architecture, but with the newer 80186 processor which was more powerful and cost effective. Al was more than willing to listen to my suggestions and that became the basis of the GBT terminal. Both projects ran into trouble, but how Bawn and Al reacted to the problems was very different. After Bawn completed the initial design of the IBM AT controller and software he began debug. His progress reports to me were all positive, and he said he was on schedule. I reported this to IOMEGA, which was very happy with the IBM PC interface card and software we had delivered, and had already put it into production. I had no reason to doubt Bawn’s reports. As we approached the date to deliver a prototype to IOMEGA Bawn said he was 90% done with debug, but was stuck. I questioned him on this, and he said only a couple of things did not work, but he could go no further. I did not understand what he was saying, engineers run into problems, but they are never “stuck”. After that report to me he basically quit working on the project. I was shocked, I explained to him he was in charge of the project, he had responsibility, something he had come to PM&E to have, yet at the first sign of trouble he was bailing? He then admitted it was not the first sign of trouble, he had been having trouble, but just did not report it to me. Again I was surprised. I explained to him that I relied on his honest reporting when I informed IOMEGA of our progress. The next day Bawn did not come to work, I called him. He said he had enough and would not be returning to work, he had quit and was moving back to San Diego. With that I took the project over and reevaluated. The prototype was due in about a month to IOMEGA, if we were to redesign the board it would take at least three months. My thought was to go back to the PIO 16 bit design like the IBM controller, but we had already sold the concept of DMA to IOMEGA. I had Al evaluate the design. He felt it could be salvaged, but with some risks. I flew to Utah and discussed the situation. I informed Tony Radman, the IOMEGA Engineering Director of what had happened, and he agreed to give us a chance to salvage the DMA design. The GBT terminal was actually ahead of schedule at this time so I put Al on the IOMEGA rescue project. He was able to get the design working and we delivered the prototype about two months late. While the product was functional, both Al and I realized that certain very important limitations of the IBM DMA controller design would result in a severe performance penalty when used with IBM DOS, the predominate operating system for the PC at that time. Even without that software penalty, our benchmarks showed that the performance of the eight bit card was better than the DMA sixteen bit card. I went back to IOMEGA with that information, and at about the same time IOMEGA marketing had decided that they really did not need an expensive 16 bit IBM AT card, people view the Bernoulli box as a backup storage device for the hard disk, so cost was more important than performance, as long as some minimum benchmark was met. Finally, working with IOMEGA disk engineers I determined that the performance of the drive itself would have to triple in performance before the eight bit controller became a bottleneck. In the end the IBM AT controller was canceled and we were paid for the work done to date. 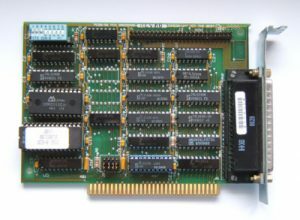 The eight bit card was a big success and we designed many variants of it over the next three years for IOMEGA and other disk drive companies. However we were penalized for the IBM AT card fiasco in one way, Iomega decided to pull the Apple project from us, which was also behind schedule, and give it to another consulting firm recommended by Apple (it was our first, and only, Apple project). Al went back to the GBT project and made great progress; we had completed the prototype and delivered it to GBT. Our tests were done on a low end IBM minicomputer which was supposed to be compatible with the entire product line. 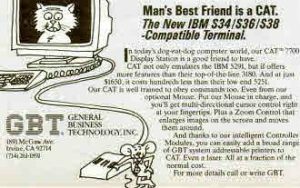 GBT had some of the high end IBM minicomputers, and when they tested the terminal on those they found problems. Al visited GBT and checked it out. It turned out that the high end machines used undocumented functions and timing that the small machines did not. Al evaluated the problem and met with me. Basically, the design as he originally architected it could not handle the timing. Unlike Bawn, Al did not give up. He studied the problem for a week, and then came up with a solution. We would have to turn the design again and add some special emulation hardware, but we could fix the problem. We informed GBT and they were happy with our evaluation and solution. We ended up delivering the final prototypes without serious delay. The lesson from this whole adventure was no matter what; deliver on your commitments, even if you have to regroup. Reputation is everything, and if PM&E did not deliver companies would not want to contract with us. Even though there was no Internet or Yelp, word gets around an industry. I also learned that stock options were not enough to infuse a “vision” in someone. I thought Bawn would see the stock options as very valuable, but he did not. The problem was that a private company stock is not valued every day like a Public Company. So the value is only in someone’s mind. To me the stock was very valuable, but not to Bawn. The equipment Bawn had given to Future Domain was valued at about $500. I offered him five times that to buy the stock back which he accepted. To me it was worth far more than that, but he felt he got a good deal on his investment. By the end of 1984 I had repurchased Bawns stock in Future Domain and never heard from him again. I learned to be far more careful in offering stock options. After Bawn left I made Al VP of Engineering, a position he had until just before he left Future Domain in 1991. Between 1982 and 1986 we did SCSI host adapter projects for most of the major disk manufacturers of the time. SCSI was a new interface technology and we had the most experience in the industry in interfacing it to IBM PC’s and the software that ran on them. SCSI was not the only technology PM&E developed on a consulting basis. We also did many projects, including disk controllers, tape controllers, floppy disk controllers, memory add-on cards for IBM PC, serial and parallel controllers, a trackball, and display terminals. We also did telephone networking projects with another bigger consulting firm called TMI in Irvine. I got to know George Wells, the CEO of TMI very well, he was well known in the industry so that helped us get more projects. PM&E was a subcontractor to TMI on a telephone company PBX designed for Olivetti of Italy. We designed the disk storage component of this digital PBX which was used by most European telephone companies. So when I was ready to launch Future Domain as a product company, why did I pick SCSI from all the types of products I had designed as a consultant?